From the middle of the 19th Century, England became the centre of music sheet publishing, with an estimated million items being published. Before this period, printed music would have been a luxury, choral groups and orchestras would buy one copy between them and then manually copy the music for themselves. 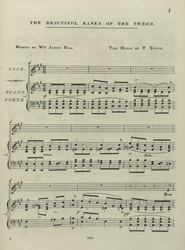 With the introduction of 'cheap music', by printing houses such as Vincent Novello's, prices were cut and printed music was available across the country. Sentimental songs such as this, were popular as they were suitable for family entertainment.